Skye (probably from the Norse 'wing-shaped'; Gaelic 'An t-Eilean Sgitheanach' - the 'island of cloud or mist'). The Isle of Skye is the second largest island in the Hebrides with only Lewis and Harris being larger. 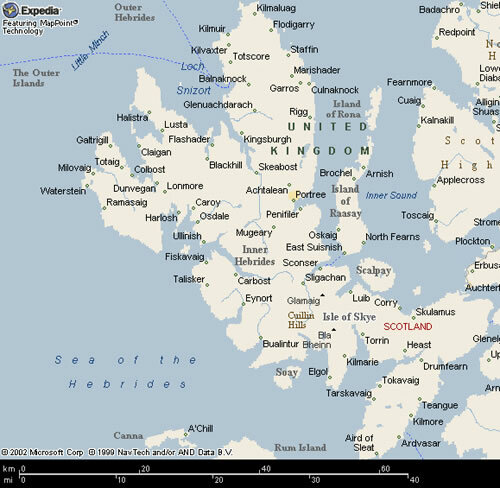 Skye is approcimately 60 miles long and up to 25 miles wide, covering an area of approximately 535 square miles. Skye is famous for many things one of which being The Cuillin Hills which dominate much of the island. There are twelve Munros in the range including Sgur Alasdair ('Alexander's peak', 3300 feet), Sgur a Greadhaich ('peak of torment', 3211 feet), Sgu nan Gillean ('the lad's peak', 3167 feet) and Bruach na Gillean ('brae of the forest', 3143 feet). 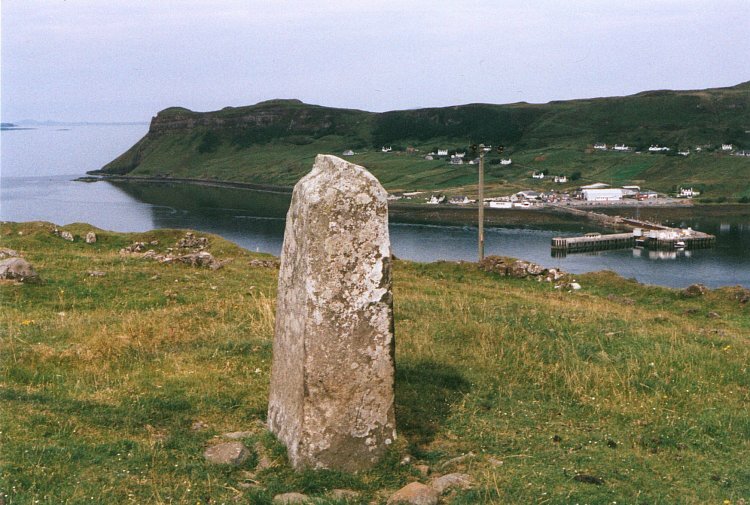 Skye was occupied from prehistoric times, and there is a fine range of monuments including numerous standing stones and burials cairns, including that at Rubh a' Dunain. The island has many brochs, duns and hill forts, some of them particularly well preserved, such as Dun Beag and Dun Ardtreck. St Columba is said to have visited the island in the 6th century, and Skye also has associations with St Maelrubha and St Moluag, early Christian missionaries. The island was held by the Vikings from the 9th century, but after Norwegian defeat at the battle of Largs in 1263, the island became more and more under the influence of the kings of Scots. The island was held by the MacLeods, MacDonalds and MacKinnons. The MacLeods were based at Dunvegan to the north of the island, while the MacDonalds held Sleat and later Trotternish, and the MacKinnons were based at Dun Ringill and Caisteal Maol, holding the east of the island as well as Scalpay. Bonnie Prince Charlie was sheltered on Skye in 1746 after the disaster at the battle of Culloden. Encroaching on the E side of the road from Uig to Portree, at NG 4256 5065, is a large overgrown cairn partly denuded at various places and at the ends. The main exis of the cairn is almost N-S and it measures 66ft in length, 40ft in breadth, and 7ft in height. Barely 100 yards SE of this cairn and about 30 yards NE of the road is a denuded small cairn measuring 15ft in diameter and less than 1ft in height. Round the circumference is a curb-like setting of small stones set on edge, rising about 9-12ins above ground, forming a regular curve. In the centre of the cairn is an open cist composed of four slabs set on edge, and measuring 2ft 6ins in length, 2ft 3ins in breadth, and at least 2ft 3ins in depth. About 50ft the the SE is a stone slab set on edge facing the NW and measuring 3ft 5ins in height, 3ft 6ins in breadth, and from 11-14 ins in thickness. Some 2 1/2ft in front of it is a prostrate pillar, 3ft 7ins in length, 2ft 11ins in breadth and at least 1ft in thickness. Cairns and standing stone as described by RCAHMS: good condition. Visited by OS (A C) 14 April 1961. 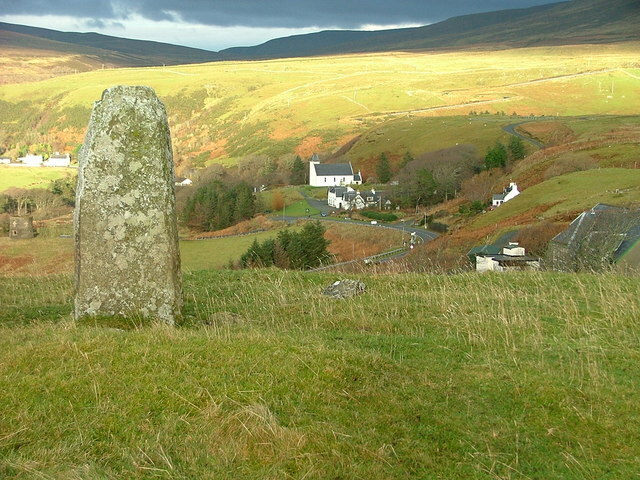 Cairn A has recently been truncated by road improvement, and lost as much as a third of its diameter from its western side. An early cutting from the east towards the centre is visible. Visited by R Miket, 26 September 1987. 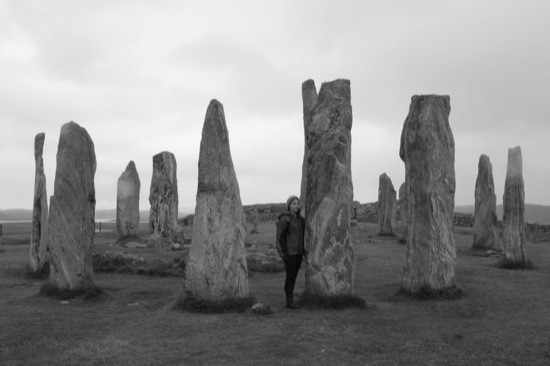 [HS definition of the monument includes the stone to the NE not noted by OS or RCAHMS]. Information from Historic Scotland, scheduling document dated 26 February 2003. The term Viking (from Old Norse víkingr) is customarily used to refer to the Norse explorers, warriors, merchants, and pirates who raided, traded, explored and settled in wide areas of Europe, Asia and the North Atlantic islands from the late 8th to the mid-11th century. These Norsemen used their famed longships to travel as far east as Constantinople and the Volga River in Russia, and as far west as Iceland, Greenland, and Newfoundland, and as far south as Al-Andalus. This period of Viking expansion – known as the Viking Age – forms a major part of the medieval history of Scandinavia, Great Britain, Ireland and the rest of Europe in general. The Old Norse feminine noun víking refers to an expedition overseas. It occurs in Viking Age runic inscriptions and in later medieval writings in set expressions such as the phrasal verb fara í víking "to go on an expedition". In later texts such as the Icelandic sagas, the phrase "to go viking" implies participation in raiding activity or piracy, and not simply seaborne missions of trade and commerce. The related Old Norse masculine noun víkingr appears in Viking Age skaldic poetry and on several rune stones found in Scandinavia, where it refers to a seaman or warrior who takes part in an expedition overseas. The form also occurs as a personal name on some Swedish rune stones. There is little indication of any negative connotation in the term before the end of the Viking Age. Regardless of its possible origins, the word was used to indicate an activity and those who participated in it, and not to any ethnic or cultural group. In Old English, the word wicing appears first in the Anglo-Saxon poem, "Widsith", which probably dates from the 9th century. In Old English, and in the history of the archbishops of Hamburg-Bremen written by Adam of Bremen in about 1070, the term is synonymous with pirate and a Scandinavian. As in the Old Norse usages, the term is not employed as a name for any people or culture in general. The word does not occur in any preserved Middle English texts. There are several theories on the etymology of the word Viking. According to recent research, the word dates from before the sail was taken into use by the Germanic peoples of North-Western Europe, because the Old Frisian spelling shows that the word was pronounced with a palatal k and thus in all probability existed in North-Western Germanic before that palatalization happened, i.e. in the 5th century or before (in the western branch). In that case the word can be explained from the Old Scandinavian maritime distance unit, vika (f.), which probably originally referred to the distance covered by one shift of rowers. The Old Norse feminine víking (as in the phrase fara í víking) may originally have been a sea journey characterized by the shifting of rowers, i.e. a long-distance sea journey, because in the pre-sail era, the shifting of rowers would distinguish long-distance sea journeys. A víkingr (the masculine) would then originally have been a participant on a sea journey characterized by the shifting of rowers. In that case, the word Viking was not originally connected to Scandinavian seafarers but assumed this meaning when the Scandinavians begun to dominate the seas. – The starting-point of the distance unit vika is the verb that in Old Scandinavian had the form víka (Old Icelandic víkja) 'to recede, turn to the side, give way, yield', and the idea behind it seems to be that the tired rower moves aside for the rested rower on the thwart when he relieves him. At the same time, vika is the same word as a week 'seven days'; in both cases the real meaning is 'a shift, a rotation'. A sea week really means 'a rotation (of rowers)', and seven days really is a rotation of week-day gods – Wednesday is Wōdanaz's day, Thursday is Þunaraz's day, Friday is Frijjō's day, etc. The idea that the word Viking is connected to the maritime distance unit vika has been put forward by at least four persons independently since the early 1980s, and has gained substantial support among scholars in recent years. Traditionally, two other explanations have been favoured: 1. The word Viking derives from the feminine that in Old Scandinavian had the form vík and which means 'a bay'. The idea would then be that the Vikings would seek shelter in bays and attack merchant ships from there, or make land raids from there. 2. Viking derives from the name Vík(in) 'the Norwegian coast of the Skagerrak Sea' (modern Viken). The idea would then be that Vikings originally was a term for the peoples of this area, and secondarily assumed the meaning 'pirates, sea raiders' because these peoples played a prominent role in the Viking raids. Both these explanations are highly problematic. The first is contradicted by the fact that all seafarers make for harbour in bays; that can hardly have distinguished the Vikings; to the contrary. According to the sources, the Vikings rather made camp on headlands and islands, which were more easily defendable from land-based armies. The second explanation faces several problems: First, people from Vík(in) are in Old Norse manuscripts referred to as víkverir 'Vík dwellers', never as víkingar. Second, no medieval source, neither from Scandinavia nor the rest of Europe, connects the Vikings with the Norwegian Skagerrak coast. Third, this explanations runs into formal linguistic problems. In addition, these explanations could only explain the masculine (Old Scandinavian víkingr) and ignore the feminine (Old Scandinavian víking), which is a serious problem because the masculine can easily be derived from the feminine but hardly vice versa. In the modern Scandinavian languages, the word Viking usually refers specifically to those people who went on Viking expeditions. The word Viking was introduced into Modern English during the 18th-century "Viking revival", at which point it acquired romanticised heroic overtones of "barbarian warrior" or noble savage. During the 20th century, the meaning of the term was expanded to refer not only to seaborne raiders from Scandinavia, but secondarily to any Scandinavian who lived during the period from the late eighth to the mid-11th centuries, or more loosely from c. 700 to as late as about 1100. As an adjective, the word is used to refer to ideas, phenomena or artefacts connected with Scandinavians and their cultural life in these centuries, producing expressions like "Viking age", "Viking culture", "Viking art", "Viking religion", "Viking ship", and so on. The people of medieval Scandinavia are also referred to as Norse, although this term properly applies only to the Old-Norse-speaking peoples of Scandinavia, and not to the Sami. Vinland was the name given to an area of North America by the Norsemen, about the year 1000 CE. The name Vinland has been interpreted in two ways: traditionally as Vínland ("wine-land") and more recently as Vinland (meadow- or pasture-land). The earliest etymology of "Vinland" is found in Adam of Bremen's 11th Century Latin Descriptio insularum Aquilonis ("Description of the Northern Islands"): "Moreover, he has also reported one island discovered by many in that ocean, which is called Winland, for the reason that grapevines grow there by themselves, producing the best wine." (Praeterea unam adhuc insulam recitavit a multis in eo repertam occeano, quae dicitur Winland, eo quod ibi vites sponte nascantur, vinum optimum ferentes). The implication is that the first element is Old Norse vín (Latin vinum), "wine". This explanation is essentially repeated in the 13th Century Grœnlendinga saga, which provides a circumstantial account of the discovery of Vinland and its being named from the grapes (vínber) found there. 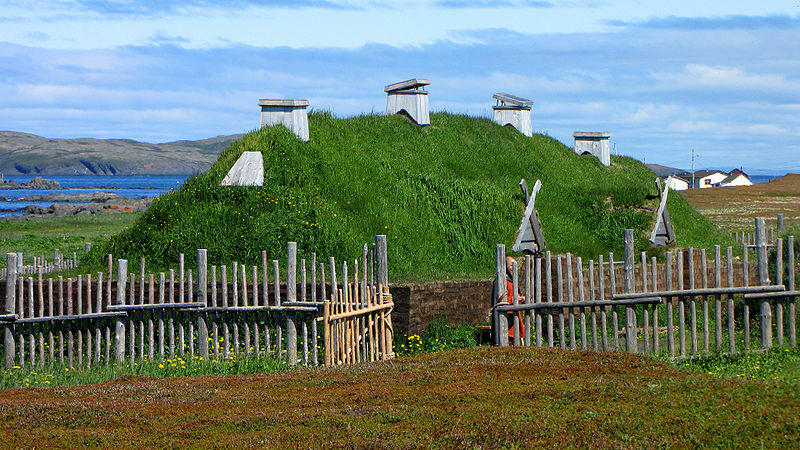 New findings from L'Anse Aux Meadows show that these vinber were in fact seen by the Norse. Another interpretation of the name Vinland, quite popular in the late 20th century, is that the first element is not vín (with a slightly lengthened vowel sound) but vin (with a short sound), an Old Norse word with the meaning 'meadow, pasture'. (Proto-Norse winju.) Vin is a common name on old farms from Norse times in Norway, and present-day use of the word are Bjørgvin, the Norse (and Icelandic) name of Bergen, Norway, and Granvin, where -vin translates as 'pasture' in both. A poetic Norse name of the Danish island of Sjælland (Zealand) was Viney 'pasture island'. A cognate name also existed in Old English (Anglo-Saxon), in the name of the village Woolland in Dorset, England: this was written "Winlande" in the 1086 Domesday Book, and it is interpreted as 'meadow land' or 'pasture land'. However, linguistics scholars demonstrated that, even as a suffix, this peculiar usage of vin had ceased long before the colonization of Iceland and Greenland. The main sources of information about the Norse voyages to Vinland are two Icelandic sagas, the Saga of Eric the Red and the Saga of the Greenlanders. These stories were preserved by oral tradition until they were written down some 250 years after the events they describe. The existence of two versions of the story shows some of the challenges of using traditional sources for history, because they share a large number of story elements but use them in different ways. For example, both sagas feature a mariner called Bjarni, who is driven off course on a voyage to Greenland and whose authority is subsequently called into question; in "Greenlanders" he is Bjarni Herjolfsson, who discovers the American mainland as a result of his mishap, but in "Eric" he is Bjarni Grimolfsson, who is driven into an area infested with shipworms on the way home from Vinland, with the result that his ship sinks. A brief summary of the plots of the two sagas, given at the end of this article, shows many more examples. The oldest surviving written record of Vinland appears in Descriptio insularum Aquilonis, by Adam of Bremen, a German (Saxon) geographer and historian, written in about 1075. To write it he visited the Danish king Svend Estridson, who had knowledge of the northern lands and told him of the "islands" discovered by Norse sailors far out in the Atlantic, of which Vinland was the most remote. Adam became confused between Helluland and Halagland, the northernmost part of medieval Norway, where the "midnight sun" is visible. He also spelled Vinland in Latin the same as Wendland, the German province which adjoins Denmark. In the early 14th century, a geography encyclopedia called Geographica Universalis was compiled at Malmesbury Abbey in England, which was in turn used as a source for one of the most widely-circulated medieval English educational works, Polychronicon by Ralph Higden, a few years later. Both these works, with Adam of Bremen as a possible source, were confused about the location of what they called Wintland—the Malmesbury monk had it on the ocean east of Norway, while Higden put it west of Denmark but failed to explain the distance. Copies of Polychronicon commonly included a world map on which Wintland was marked in the Atlantic Ocean near Iceland, but again much closer to the Scandinavian mainland than in reality. The name was explained in both texts as referring to the savage inhabitants' ability to tie the wind up in knotted cords, which they sold to sailors who could then undo a knot whenever they needed a good wind. Neither mentioned grapes, and the Malmesbury work specifically states that little grows there but grass and trees, which reflects the saga descriptions of the area round the main Norse expedition base. More geographically correct were Icelandic texts from about the same time, which presented a clear picture of the northern countries as experienced by Norse explorers: north of Iceland a vast, barren plain (which we now know to be the Polar ice-cap) extended from Biarmeland (northern Russia) east of the White Sea, to Greenland, then further west and south were, in succession, Helluland, Markland and Vinland. The Icelanders had no knowledge of how far south Vinland extended, and they speculated that it might reach as far as Africa. The "Historia Norwegiae" (History of Norway) compiled around 1200 does not refer directly to Vinland and tries to reconcile information from Greenland with mainland European sources; in this text Greenland's territory extends so that it is "almost touching the African islands, where the waters of ocean flood in". Erik Thorvaldsson (Old Norse: Eirīkr Þōrvaldsson; 950 – c. 1003 CE), known as Erik the Red (Old Norse: Eirīkr hinn rauði), is remembered in medieval and Icelandic saga sources as having founded the first Nordic settlement in Greenland. The Icelandic tradition indicates that he was born in the Jæren district of Rogaland, Norway, as the son of Thorvald Asvaldsson, he therefore also appears, patronymically, as Erik Thorvaldsson (Eiríkr Þorvaldsson). The appellation "the Red" most likely refers to his hair color. Leif Ericson, the famous Icelandic explorer, was Erik's son. Erik the Red's parents left Norway on account of manslaughter. Along with him, the family settled in Hornstrandir in West Iceland. The Icelanders later sentenced Erik to a three-year exile for several murders around the year 982. After marrying Thorild (also known as Thjordhild), he moved to Haukadal (Hawksdale) where he built a farm. The initial confrontation happened when his slaves started a landslide on the neighboring farm belonging to Valthjof. Valthjof's friend, Eyiolf the Foul, killed the slaves. In return, Erik killed Eyiolf and Holmgang-Hrafn (Dueling-Raven). Eyiolf's kinsmen demanded his banishment from Haukadal. Erik then moved to the island of Öxney. He asked Thorgest to keep his setstokkr, inherited ornamented beams of significant mystical value, which his father had brought from Norway. When he had finished his new house, he went back to get them, but they "could not be obtained". Erik then went to Breidabolstad and took them. These are likely to have been Thorgest's setstokkr, although the sagas are unclear at this point. Thorgest gave chase, and in the ensuing fight Erik slew both Thorgest's sons and "a few other men". After this each of them retained a considerable body of men with him at his home. Styr gave Eric his support, as did also Eyiolf of Sviney, Thorbjiorn, Vifil's son, and the sons of Thorbrand of Alptafirth; while Thorgest was backed by the sons of Thord the Yeller, and Thorgeir of Hitardal, Aslak of Langadal and his son Illugi. Even though popular history credits Erik as the first person to discover Greenland, the Icelandic sagas suggest that earlier Norsemen discovered and tried to settle it before him. Tradition credits Gunnbjörn Ulfsson (also known as Gunnbjörn Ulf-Krakuson) with the first sighting of the land-mass. Nearly a century before Erik, strong winds had driven Gunnbjörn towards a land he called "Gunnbjarnarsker" ("Gunnbjörn's skerries"). But the accidental nature of Gunnbjörn's discovery has led to his neglect in the history of Greenland. After Gunnbjörn, Snaebjörn Galti had also visited Greenland. According to records from the time, Galti headed the first Norse attempt to colonize Greenland, which ended in disaster. Erik the Red was the first permanent European settler. In this context, about 982, Erik sailed to a somewhat mysterious and little-known land. He rounded the southern tip of the island (later known as Cape Farewell) and sailed up the western coast. He eventually reached a part of the coast that, for the most part, seemed ice-free and consequently had conditions—similar to those of Iceland—that promised growth and future prosperity. According to the Saga of Erik the Red, he spent his three years of exile exploring this land. The first winter he spent on the island of Eiriksey, the second winter he passed in Eiriksholmar (close to Hvarfsgnipa). In the final summer he explored as far north as Snaefell and in to Hrafnsfjord. When Erik returned to Iceland after his exile had expired, he is said to have brought with him stories of "Greenland". Erik deliberately gave the land a more appealing name than "Iceland" in order to lure potential settlers. He explained, "people would be attracted to go there if it had a favorable name". He knew that the success of any settlement in Greenland would need the support of as many people as possible. His salesmanship proved successful, as many people (especially "those Vikings living on poor land in Iceland" and those that had suffered a "recent famine") became convinced that Greenland held great opportunity. After spending the winter in Iceland, Erik returned to Greenland in 985 with a large number of colonists and established two colonies on its southwest coast: the Eastern Settlement or Eystribyggð, in modern-day Qaqortoq, and the Western Settlement or Vestribyggð, close to present-day Nuuk. 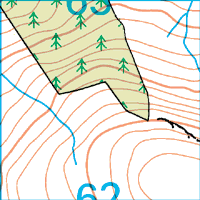 (Eventually, a Middle Settlement grew, but many people suggest it formed part of the Western Settlement.) The Eastern and Western Settlements, both established on the southwest coast, proved the only two areas suitable for farming. During the summers, when the weather favored travel more, each settlement would send an army of men to hunt in Disko Bay above the Arctic Circle for food and other valuable commodities such as seals (used for rope), ivory from Walrus tusks, and beached whales. In Eystribyggð, Erik built the estate Brattahlíð, near present-day Narsarsuaq. He held the title of paramount chieftain of Greenland and became both greatly respected and wealthy. The settlement venture involved 25 ships, 14 of which made the journey successfully; of the other 11, some turned back, while others disappeared at sea. The settlement flourished, growing to 5000 inhabitants spread over a considerable area along Eriksfjord and neighboring fjords. Groups of immigrants escaping overcrowding in Iceland joined the original party. However, one group of immigrants which arrived in 1002 brought with it an epidemic that ravaged the colony, killing many of its leading citizens, including Erik himself. Nevertheless, the colony rebounded and survived until the Little Ice Age made the land marginal for European life-styles in the 15th century (shortly before Christopher Columbus's voyage to the Canary Islands in 1492). Pirate raids, conflict with Inuit moving into the Norse territories, and the colony's abandonment by Norway became other factors in its decline. The medieval Icelandic tradition relates that Erik the Red and his wife Þjóðhildr (Thjodhildr) had four children: a daughter, Freydís, and three sons, the explorer Leif Eiríksson, Þorvaldr (Thorvald) and Þorsteinn (Thorstein). Erik himself remained a follower of Norse paganism, unlike his son Leif and Leif's wife, who became Christians. Thjothhild was the daughter of Jørundur Ulfsson and Thorbjørg Gilsdottir (from whom Gilsfjørd is named). Jørund's mother Bjørg was granddaughter to Irish king Cerball mac Dúnlainge (Kjarval) through his daughter Rafarta. While not the first to sight the North American continent, Leif Erikson became the first Viking to explore the land of Vinland (part of North America, probably near modern-day Newfoundland). Leif invited his father on the voyage, but according to legend, Erik fell off his horse on his way to the ship and took this as a bad sign, leaving his son to continue without his company. Erik died the winter after his son's departure. There is no evidence that Leif was aware of his father's death until he got back to Greenland. For much of the time that the Norse survived in Greenland, they had a very tough life that demanded finding a balance between maintaining population levels and finding enough food and supplies to survive. Most of the time they had just enough supplies to continue their societies. Despite the Norse settlers' constant struggle, at Norse Greenland's peak at c. 1126 the inhabitants numbered between 2000 and 4000. The Eastern Settlement had around "190 small farms, 12 parish churches, a cathedral, an Augustinian monastery and a Benedictine nunnery". Even though smaller than the Eastern Settlement, the Western Settlement still had "90 farms and four churches", while the smallest Middle Settlement had only around "20 farms". Despite enjoying what some might consider a reasonable amount of time on Greenland in conjunction with varying times of successes and failures, the Norse settlement in Greenland did not last more than 500 years. Jared Diamond gives a rationale for this, as have others. He presents a five-step process that explains the collapse of civilizations and offers Greenland as an example of this process. The Norse had become separated from their kin in Europe for so long that most of their friendships and alliances had fallen away, hurting some of their trading and eventual protection; political changes in Europe hastened this process. Perhaps more significantly, a change in climate in the North Atlantic led to an increase in sea-ice, making communication with Europe difficult, and favoring migrations of the Inuit from northern Greenland to the south and to regular contact with the Norse, leading to violence between the groups. Finally, and most importantly, the Norse failed to adapt fully to their surroundings. They clung too much to familiar ways of living that proved ultimately unsuitable in Greenland. Despite the apparent failure of the Norse Greenland colonies, they mark one of the great achievements in Norse expansion and exploration. Olaf II Haraldsson (995 – July 29, 1030) was King of Norway from 1015 to 1028. He was posthumously given the title Rex Perpetuus Norvegiae (English: Norway's Eternal King) and canonised in Nidaros (Trondheim) by Bishop Grimkell, one year after his death in the Battle of Stiklestad on 29 July 1030. Enshrined in Nidaros Cathedral. Olaf's local canonisation was in 1164 confirmed by Pope Alexander III, making him a universally recognized saint of the Catholic Church. The exact position of Saint Olaf's grave in Nidaros has been unknown since 1568, due to the Lutheran iconoclasm in 1536-37. Saint Olaf has today a prominent legal as well as cultural position in the country. He is symbolised by the axe in Norway's coat of arms, and the Olsok (29th July) is still his day of celebration. The Order of St. Olav is named after him. Olaf II's Old Norse name is Ólafr Haraldsson. He was during his lifetime known as Olaf digre (modern orthography). Today, he is commonly referred to as Olav den hellige (Bokmål; Olaf the Holy) or Heilag-Olav (Nynorsk; the Holy Olaf) in honour of his sainthood. Olaf Haraldsson had the given name Óláfr in Old Norse. (Etymology: Anu – "forefather", Leifr – "heir".) Olav is the modern equivalent in Norwegian, formerly often spelt Olaf. His name in Icelandic is Ólafur, in Faroese Ólavur, in Danish Oluf, in Swedish Olof. Olave was the traditional spelling in England, preserved in the name of medieval churches dedicated to him. Other names, such as Oláfr hinn helgi, Olavus rex, and Olaf are used interchangeably (see the Heimskringla of Snorri Sturluson). He is sometimes referred to as Rex Perpetuus Norvegiae (English: Norway's Eternal King), a designation which goes back to the thirteenth century. The term Ola Nordmann as epithet of the archetypal Norwegian may originate in this tradition, as the name Olav for centuries was the most common male name in Norway. Olaf was born in Ringerike. His mother was Åsta Gudbrandsdatter, and his father was Harald Grenske, great-great-grandchild of Harald Fairhair, the first king of Norway. Harald Grenske died when Åsta Gudbrandsdatter was pregnant with Olaf. She later married Sigurd Syr, with whom she had other children including Harald Hardrada who would reign as a future king of Norway. Olaf was the subject of several biographies, both hagiographies and sagas, in the Middle Ages, and many of the historical facts concerning his reign are disputed. The best known description is the one in Snorri Sturluson's Heimskringla, from c. 1230. That saga cannot be taken as an accurate source for Olaf's life, but most of the following description is based on the narrative there. About 1008, Olaf landed on Estonian island Saaremaa (Osilia). The Osilians, taken by surprise, had at first agreed to pay the demands made by Olaf, but then gathered an army during the negotiations and attacked the Norwegians. Olaf nevertheless won the battle. As a teenager he went to the Baltic, then to Denmark and later to England. Olaf saw it as his call to unite Norway into one kingdom, as his ancestor Harald I of Norway largely succeeded. On the way home he wintered with Duke Richard II of Normandy. This region had been conquered by the Norseman in the year 881. Duke Richard was himself an ardent Christian, and the Normans had also previously converted to Christianity. Before leaving, Olaf was baptized in Rouen. Olaf returned to Norway in 1015 and declared himself king, obtaining the support of the five petty kings of the Uplands. Norway during the reign of St. Olaf (1015–1028) showing areas under the control of hereditary chieftains (petty kingdoms). In 1016 he defeated Earl Sweyn, hitherto the virtual ruler of Norway, at the Battle of Nesjar. He founded the town Borg by the waterfall Sarpsfossen, later to be known as Sarpsborg in Østfold county, Norway. Within a few years he had won more power than had been enjoyed by any of his predecessors on the throne. He had annihilated the petty kings of the South, subdued the aristocracy, enforced the acceptance of Christianity throughout the kingdom, asserted his suzerainty in the Orkney Islands, and conducted a successful raid on Denmark. He made peace with King Olof Skötkonung of Sweden through Þorgnýr the Lawspeaker, and was for some time engaged to his daughter, Princess Ingegerd Olofsdotter, though without Olof's approval. In 1019 Olaf married Astrid Olofsdotter, Olof's illegitimate daughter and half-sister of his former fiancée. Their daughter Wulfhild married Ordulf, Duke of Saxony in 1042. Numerous royal, grand ducal and ducal lines are descended from Ordulf and Wulfrid, including the House of Saxe-Coburg and Gotha. Maud of Wales, daughter of King Edward VII of the United Kingdom, was the mother of King Olav V of Norway, so Olav and his son Harald V, the present king of Norway, are thus descended from Olaf. But Olaf's success was short-lived. In 1026 he lost the Battle of the Helgeå, and in 1029 the Norwegian nobles, seething with discontent, supported the invasion of King Canute the Great of Denmark. Olaf was driven into exile in Kievan Rus. During the exile he stayed some time in Sweden in the province of Nerike where, according to local legend, he baptized many locals. In 1030, Canute's Norwegian vassal king, Jarl Håkon Eiriksson, was lost at sea. Olaf seized the opportunity to win back the kingdom, but he fell at the Battle of Stiklestad, where some of his own subjects from central Norway were arrayed against him. Canute, though distracted by the task of administrating England, managed to rule Norway for five years after Stiklestad, with his son Svein as viceroy. However, when Olaf's illegitimate son Magnus (dubbed 'the Good') laid claim to the Norwegian throne, Canute had to yield. Olaf, a rather harsh ruler and prone to rough treatment of his enemies, ironically became Norway's patron saint. His canonization was performed only a year after his death by bishop Grimkell. The cult of Olaf not only unified the country, it also fulfilled the conversion of the nation, something for which the king had fought so hard. While divisive in life, in death Olaf wielded a unifying power no foreign monarch could hope to undo. Owing to Olaf's later status as the patron saint of Norway, and to his importance in later medieval historiography and in Norwegian folklore, it is difficult to assess the character of the historical Olaf. Judging from the bare outlines of known historical facts, he appears, more than anything else, as a fairly unsuccessful ruler, who had his power based on some sort of alliance with the much more powerful King Canute the Great; who was driven into exile when he claimed a power of his own; and whose attempt at a reconquest was swiftly crushed. Olaf and Olaf Tryggvasson together were the driving force behind Norway's final conversion to Christianity. However, large stone crosses and other Christian symbols suggest that at least the coastal areas of Norway were deeply influenced by Christianity long before Olav's time; with one exception, all the rulers of Norway back to Håkon the Good (c. 920–961) had been Christians; and Olav's main opponent, Canute the Great, was a Christian ruler. What seems clear is that Olav made efforts to establish a church organization on a broader scale than before, among other things by importing bishops from England, Normandy and Germany, and that he tried to enforce Christianity also in the inland areas, which had the least communication with the rest of Europe, and which economically were more strongly based on agriculture, so that the inclination to hold on to the former fertility cult would have been stronger than in the more diversified and expansive western parts of the country. Although Olav was certainly not the first to introduce Christianity to Norway, he established the first codification of the faith in 1024, thus laying the basis for the Church of Norway. So high did Olaf's legal arrangements for the Church of Norway come to stand in the eyes of the Norwegian people and clergy, that when Pope Gregory VII attempted to make clerical celibacy binding on the priests of Western Europe in 1074–5, the Norwegians largely ignored this, since there was no mention of clerical celibacy in Olaf's legal code for their Church. Only after Norway was made a metropolitan province with its own archbishop in 1153 —which made the Norwegian church, on the one hand, more independent of its king, but, on the other hand, more directly responsible to the Pope — did canon law gain a greater predominance in the life and jurisdiction of the Norwegian church. Sigrid Undset noted that Olaf was baptized in Rouen, the capital of Normandy, and suggested that Olaf used priests of Norman descent for his missionaries. These priests would be of Norwegian descent, could speak the language, and shared the culture of the people they were to convert. Since the Normans themselves had only been in Normandy for about two generations, these priests might, at least in some cases, be distant cousins of their new parishioners and thus less likely to be killed when Olaf and his army departed. The few surviving manuscripts and the printed missal used in Archdiocese of Nidaros show a clear dependence on the missals used in Normandy. It should be mentioned that King Olaf II's attempts to convert Norway involved coercion and violence, as described in the Heimskringla and other sources. Among the bishops that Olaf brought with him from England, was Grimkell (Grimkillus). He was probably the only one of the missionary bishops who was left in the country at the time of Olaf's death, and he stood behind the translation and beatification of Olaf on August 3, 1031. Grimkell later became the first bishop of Sigtuna in Sweden. At this time, local bishops and their people recognized and proclaimed a person a saint, and a formal canonization procedure through the papal curia was not customary; in Olaf's case, this did not happen until 1888. Grimkell was later appointed bishop in the diocese of Selsey in the south-east of England. This is probably the reason why the earliest traces of a liturgical cult of St Olaf are found in England. An office, or prayer service, for St Olaf is found in the so-called Leofric collectar (c. 1050), which was bequeathed in his last will and testament by Bishop Leofric of Exeter to Exeter Cathedral. This English cult seems to have been short-lived. Adam of Bremen, writing around 1070, mentions pilgrimage to Saint Olav's shrine in Nidaros, but this is the only firm trace we have of a cult of St. Olaf in Norway before the middle of the twelfth century. By this time he was also being referred to as Norway's Eternal King. In 1152/3, Nidaros was separated from Lund as the archbishopric of Nidaros. It is likely that whatever formal or informal — which, we do not know — veneration of Olav as a saint there may have been in Nidaros prior to this, was emphasised and formalized on this occasion. During the visit of the papal legate, Nicholas Brekespear (later Pope Adrian IV), the poem Geisli ("the ray of sun") was recited. In this poem, we hear for the first time of miracles performed by St. Olaf. One is the killing and throwing onto the mountain of a still visible sea serpent. One of these took place on the day of his death, when a blind man got his eyesight back again after having rubbed his eyes with hands that were stained with the blood from the saint. The texts which were used for the liturgical celebration of St. Olaf during most of the Middle Ages were probably compiled or written by Eystein Erlendsson, the second Archbishop of Nidaros (1161–1189). The nine miracles reported in Geisli form the core of the catalogue of miracles in this office. The celebration of St. Olaf was widespread in the Nordic countries. Apart from the early traces of a cult in England, there are only scattered references to him outside of the Nordic area. Several churches in England were dedicated to him (often as St Olave). St Olave's Church, York is referred to in the Anglo Saxon Chronicle for 1055 as the place of burial of its founder Earl Siward. This is generally accepted to be the earliest datable church foundation to Olaf and is further evidence of a cult of St Olaf in the early 1050s in England. St Olave Hart Street in the City of London is the burial place of Samuel Pepys and his wife. Another south of London Bridge gave its name to Tooley Street and to the St Olave's Poor Law Union, later to become the Metropolitan Borough of Bermondsey: its workhouse in Rotherhithe became the St Olave's Hospital, now an old-people's home a few hundred metres from St Olaf's Church, which is the Norwegian Church in London. It also led to the naming of St Olave's Grammar School, which was established in 1571 and up until 1968 was situated in Tooley Street. In 1968 the school was moved to Orpington, Kent. St. Olaf was also, together with the Mother of God, the patron saint of the chapel of the Varangians, the Scandinavian warriors who served as the bodyguard of the Byzantine emperor. This church is believed to have been located near the church of Hagia Irene in Constantinople. The icon of the Madonna Nicopeia, presently in St. Mark's Basilica in Venice, which is believed to have been one traditionally carried into combat by the Byzantine military forces, is believed to have been kept in this chapel in times of peace. Thus St. Olaf was also the last saint to be venerated by both the Western and Eastern churches before the Great Schism. There is also an altar dedicated to St. Olaf in the church of Sant'Ambrogio e Carlo al Corso in Rome with a painting of the saint given to Pope Leo XIII in 1893 on the occasion of the golden jubilee of his ordination as a bishop by Wilhelm Wedel-Jarlsberg as its altarpiece. Recently the pilgrimage route to Nidaros Cathedral, the site of St. Olav's tomb, has been reinstated. The route is known as Saint Olav's Way. The main route, which is approximately 640 km long, starts in the ancient part of Oslo and heads North, along Lake Mjosa, up the Gudbrandsdal Valley, over Dovrefjell and down the Orkdal Valley to end at Nidaros Cathedral in Trondheim. There is a Pilgrim's Office in Oslo which gives advice to Pilgrims, and a Pilgrim Centre in Trondheim, under the aegis of the Cathedral, which awards certificates to successful Pilgrims upon the completion of their journey. But, the relics of St. Olaf is no longer in the Nidaros Cathedral. They rest in St. Olaf's Cathedral in Oslo. On 29 July the Faroe Islands celebrates Ólavsøka (Saint Olaf celebration), the National Day also, when they remember Saint Olaf, the king who Christianized the islands. Let us all rejoice in the Lord on the feast of blessed Olav, Norway's eternal king. The angels exult over his martyrdom and praise the Son of God. Almighty, eternal God, you are the crown of kings and the triumph of martyrs. We know that your blessed martyr, Olav, intercedes for us before your face. We praise your greatness in his death and we pray you, give us the crown of life that you have promised those who love you, through our Lord Jesus Christ, your Son, who lives and reigns with you and the Holy Spirit, one God, forever and ever. Old Testament Reading: Wisdom of Solomon 10: 10–14. Responsory Psalm: Psalm 31 (30): 1–7 with the response: "Into your hands, Lord, I commend my spirit." Epistle: James 1: 2–4, 12. Alleluia. Holy Olav, you who rejoice with the angels of heaven, pray for us that we may be worthy to present our sacrifice of praise before the Lord. Alleluia. Almighty God, in awe we call upon your inscrutable might. Make holy these created things which you have chosen so that they may become the body and blood of Christ, your Son. Through the intercession of the holy Olav, king and martyr, let them for the salvation of body and soul. Through Christ our Lord. Great is his glory through your saving help. With glory and honor will you clothe him, Lord. We who have been fed at the table of the Lamb implore you, almighty God, through the intercession of your blessed martyr Olav let us always stand under the protection of your Son who redeemed us by his death on the cross, he who lives and reigns from eternity to eternity. St. Olaf College was founded by Norwegian immigrant Bernt Julius Muus in Northfield, Minnesota, in 1874. St Olav's Church is the tallest church in Tallinn, Estonia, and between 1549 and 1625 was the tallest building in the world. The coat of arms of the Church of Norway contains two axes, the instruments of Saint Olav's martyrdom. The oldest picture of St. Olav is painted on a column in the Church of the Nativity in Bethlehem. The only country which keeps July 29 as a holiday is the Faroe Islands; see Ólavsøka. The Royal Norwegian Order of St. Olav was founded in 1847 by Oscar I, king of Norway and Sweden, in memory of this king. Saint Olaf Catholic Church  in downtown Minneapolis and the statue of the saint from the sanctuary. T.S.C Sint Olof is a Dutch student organisation with St. Olav as its patron. Chief Seattle (an Anglicization of Si'ahl), (Lushootseed pronunciation: [ˈsiʔaːɬ], originally [ˈsiʔaːtɬʼ]; c. 1780 - June 7, 1866) was a Dkhw’Duw’Absh (Duwamish) chief, also known as Sealth, Seathle, Seathl, or See-ahth. A prominent figure among his people, he pursued a path of accommodation to white settlers, forming a personal relationship with David Swinson "Doc" Maynard. Seattle, Washington was named after him. A widely publicized speech arguing in favor of ecological responsibility and respect of native Americans' land rights has been attributed to him; however there is controversy about what, if anything, he actually said. Si’ahl's mother Sholeetsa was Dkhw’Duw’Absh (Duwamish) and his father Shweabe was chief of the Dkhw’Suqw'Absh (the Suquamish tribe). Si’ahl was born around 1780 on or near Blake Island, Washington. One source cites his mother's name as Wood-sho-lit-sa. The Duwamish tradition is that Si’ahl was born at his mother's Dkhw’Duw’Absh village of Stukw on the Black River, in what is now the city of Kent, and that Si'ahl grew up speaking both the Dkhw’Duw’Absh and Dkhw’Suqw'Absh dialects of Lushootseed. Because Native descent among the Salish peoples was not solely patrilineal, Si'ahl inherited his position as chief of the Dkhw’Duw’Absh or Suquamish Tribe from his maternal uncle. In later years, Si’ahl claimed to have seen the ships of the Vancouver Expedition as they explored Puget Sound. Si’ahl earned his reputation at a young age as a leader and a warrior, ambushing and defeating groups of enemy raiders coming up the Green River from the Cascade foothills, and attacking the Chimakum and the S'Klallam, tribes living on the Olympic Peninsula. Like many of his contemporaries, he owned slaves captured during his raids. He was tall and broad for a Puget Sound native at nearly six feet; Hudson's Bay Company traders gave him the nickname Le Gros (The Big One). He was also known as an orator; and when he addressed an audience, his voice is said to have carried from his camp to the Stevens Hotel at First and Marion, a distance of 3/4 of a mile. He took wives from the village of Tola'ltu just southeast of Duwamish Head on Elliott Bay (now part of West Seattle). His first wife La-Dalia died after bearing a daughter. He had three sons and four daughters with his second wife, Olahl. The most famous of his children was his first, Kikisoblu or Princess Angeline. Si’ahl was baptized in the Roman Catholic Church, and given the baptismal name Noah, probably in 1848 near Olympia, Washington. The meaning of this ceremony may be called into question by his references to his people's gods in his most famous Talk (below). For all his skill, Si’ahl was gradually losing ground to the more powerful Patkanim of the Snohomish when white settlers started showing up in force. When his people were driven from their traditional clamming grounds, Si’ahl met Maynard in Olympia; they formed a friendly relationship useful to both. Persuading the settlers at Duwamps to rename the town Seattle, Maynard established their support for Si’ahl's people and negotiated relatively peaceful relations among the tribes. The Duwamish (pronounced [dxʷdɐwʔabʃ] in Lushootseed) are a Lushootseed Native American tribe in western Washington, and the indigenous people of metropolitan Seattle, where they have been living since the end of the last glacial period (c. 8000 BCE, 10,000 years ago). The Duwamish tribe descends from at least two distinct groups from before intense contact with people of European ancestry—the People of the Inside (the environs of Elliott Bay) and the People of the Large Lake (Lake Washington)—and continues to evolve both culturally and ethnically. By historic language, the Duwamish are (Skagit-Nisqually) Lushootseed; Lushootseed is a Salishan language. Adjacent tribes throughout the Puget Sound-Strait of Georgia basin were, and are, interconnected and interrelated, yet distinct. The present-day Duwamish tribe developed in parallel with the times of the Treaty of Point Elliott and its aftermath in the 1850s. Although not recognized by the U.S. federal government, the Duwamish remain an organized tribe with roughly 500 enrolled members as of 2004. In 2009, the Duwamish tribe opened the Duwamish Longhouse and Cultural Center on purchased land near their ancient settlement of Ha-AH-Poos (also written hah-AH-poos) in West Seattle near the mouth of the Duwamish River. 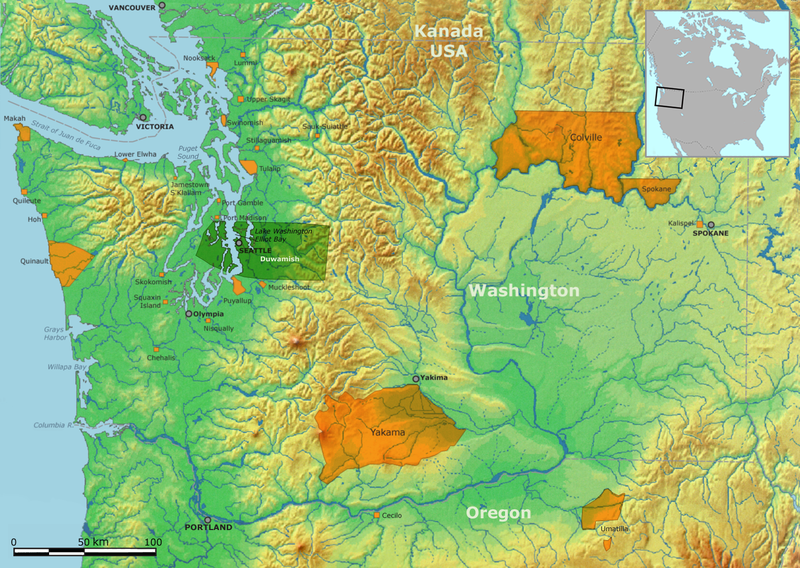 The Suquamish are a Lushootseed-speaking Native American Tribe, located in present-day Washington in the United States. The Suquamish are a southern Coast Salish people; they spoke a dialect of Lushootseed, which belongs to the Salishan language family. Like many Northwest Coast natives, the Suquamish relied on fishing from local rivers and Puget Sound for food. They built plank longhouses to protect themselves from the wet winters west of the Cascade Mountains. The Suquamish traditionally lived on the western shores of Puget Sound, from Apple Tree Cove in the north to Gig Harbor in the south, including Bainbridge Island and Blake Island. During the summer, the Suquamish were widely dispersed, but during the winter, they lived in a winter village centered around Old Man House, the largest longhouse on Puget Sound. The first contact between the Suquamish and European explorers came in 1792 when George Vancouver explored Puget Sound and met with members of the Suquamish tribe, possibly including Schweabe and Kitsap. More regular contact with non-Indians came with the establishment of British trading posts in Puget Sound and the Strait of Georgia in the early 19th century. Once the Washington Territory was established in 1853, the U.S. government began signing treaties with area tribes to acquire their lands. The Suquamish people ceded most of their land to the United States when they signed the Point Elliott Treaty on January 22, 1855. They were able to retain some land, the Port Madison Indian Reservation, near their winter village site on Agate Pass. Though the Puget Sound Salish peoples were not generally organized above the level of individual villages, the Suquamish had a central location on Puget Sound. Two members of the Suquamish came to be recognized across the region as great leaders. One was Kitsap, who led a coalition of Puget Sound tribes against the Cowichan Tribes of Vancouver Island around 1825. Another was Seattle (also spelled Sealth, See-ahth, and Seathl, pronounced [ˈsiʔaːɬ]), son of Schweabe, who was a great orator and peace-keeper during the turbulent times of the mid-19th century. Though both Kitsap and Sealth are often called "Chief", this is an attribution by English speakers; such designations were not used by the Puget Sound Indians themselves. Blake Island is an island in Washington state in the United States. It lies in the middle of Puget Sound, north of Vashon Island, south of Bainbridge Island and east of Manchester. Blake Island is a 475 acres (1.9 km2) marine camping park with five miles of saltwater beach shoreline providing unobstructed views of the Olympic Mountains and the Seattle skyline. There is a small marina and limited mooring buoys. The park is only reachable by tour boat or private boat. On the northeast end of the island is Tillicum Village, a showcase for Northwest Coast Indian arts, culture, and food. The island is home to a variety of wildlife, including deer that sometimes swim from the mainland to the island from Manchester. She was born around 1820 to Chief Seattle in what is now Rainier Beach in Seattle, Washington. She was named Angeline by Catherine Broshears Maynard, the second wife of Doc Maynard. The 1855 Treaty of Point Elliott required that all Duwamish Indians leave their land for reservations, but Angeline remained in Seattle in a waterfront cabin on Western Avenue between Pike and Pine Streets, near what is now Pike Place Market. She did laundry and sold handwoven baskets through the Ye Olde Curiosity Shop. She died on May 31, 1896 and was buried in Lake View Cemetery on Capitol Hill. May 29, 1896. 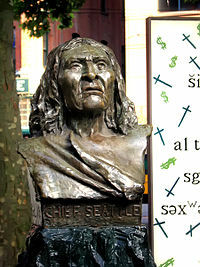 With the death of Angeline Seattle died the last of the direct descendants of the great Chief Seattle for whom this city was named. Angeline—Princess Angeline—as she was generally called, was famous all over the world… Angeline was a familiar figure of the streets, bent and wrinkled, a red handkerchief over her head, a shawl about her, walking slowly and painfully with the aid of a cane; it was no infrequent sight to see this poor old Indian woman seated on the sidewalk devoutly reciting her beads. The kindness and generosity of Seattle’s people toward the daughter of the chief… was shown in her funeral obsequies which took place from the Church of Our Lady of Good Help. The church was magnificently decorated; on the somber draped catafalque in a casket in the form of a canoe rested all that was mortal of Princess Angeline. S. Angeline Street on Seattle's Beacon Hill and in Columbia City and Seward Park was named after Princess Angeline. THERE ARE STILLL MANY RELATIVES LIVINNG IN THE SEATTLE AREA, SOME I KNOW PERSONALLY.